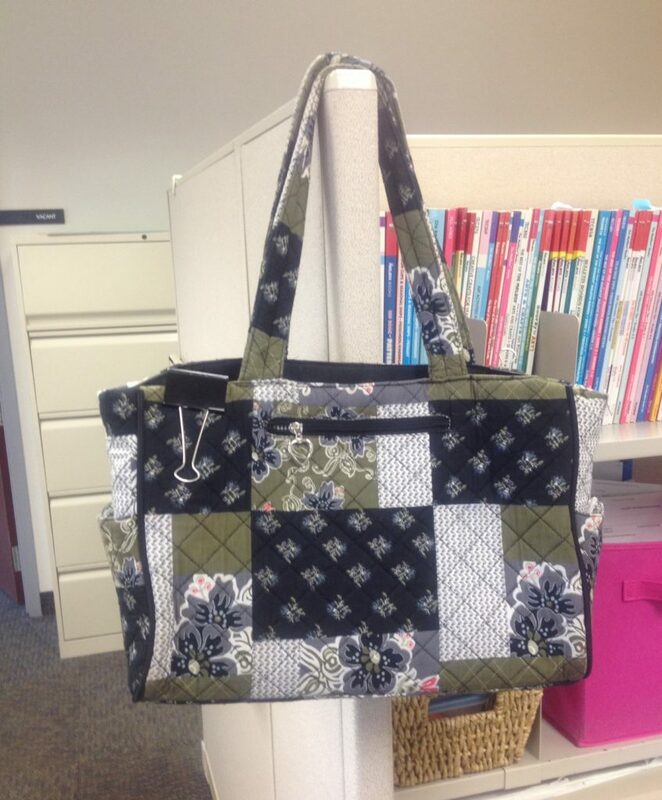 Is There a Perfect Teacher Tote? The perfect teacher tote would be no tote at all, correct? And if you are a teacher who never has homework, I am in awe of you! My teaching experiences (and those of my teaching peeps) confirm that a night without teacher homework is a rarity. So what is the best tote for a teacher? The teachers I know carry a variety of vessels. Some carry tote bags. One teacher I know carries a very impressive leather satchel that she snagged from a thrift store. Another carries a backpack. Milk crates are popular but backbreaking unless you have a rollie dealie. I recently noticed that a major office supply store sells a mobile folding cart with a lid that looks a lot like a milk crate on wheels. I was impressed by that! I carry the knockoff cloth bag pictured. I love this bag because of its width. I love this bag so much that when one of the handles ripped off, I took the bag to a shoe repair shop and had the handle reattached. Actually, I had both handles securely stitched in place. What’s your favorite teacher tote—other than no tote at all? I have a 31 bag also with the stiff organizer inside. I love the boxes on wheels because carrying things has gotten too cumbersome at times. I usually will put my things in one of my reusable shopping bags I have received for free. I think I must have at least 100 of them by now in various sizes, styles and colors. Black basic and large enough to carry only a few files home. For the start, end, and special days of the school year, I break out the box on wheels. I like the Calvin Klein Saffiano Tote! It is so pretty and just the right size. Another I own and also like is Ann Taylor Mini Peppled tote. All stylish and pretty! My favorite tote was a pull cart on wheels, until I kept overloading it. The handle broke. ? I have a 31 tote also, and the Peppled tote. I like both and use them for different days as I find alternating helps me to stay organized better. I place a small rectangular, plastic file crate inside a re-usable grocery tote. It makes grading easier, because I just load it up with file folders. I do not have to worry about anything getting lost or out of order. Also, it sits upright on the ground due to the plastic crate. I like that idea! I’m going to try to create one this weekend. Thanks! I have a tote from Target. It’s a pretty teal color. The bottom is about 14 inches long and 5 inches wide, the sides are straight up, it has two handles, and it has a wire frame to hold a few hanging files. Two pockets on one side hold my wallet, keys, hand lotion, blue and green pens, and a few pieces of chocolate. All that’s missing is a top to protect the contents from rain and snow. This bag sounds like a real find! Thanks for sharing, Lauren! I use an extra large monogrammed LLBean boat tote. It is super strong, washes easily, and lasts for years! A bag on wheels! Love it!